Yesterday was a big day. 14 hours from beginning to end at the hospital for Ryan's Gamma Knife Radiation. As thankful as I am for the technology that will surely help my husband, I am so glad that yesterday is over. It's hard to explain what feeling helpless is like. It mentally hurts so much that your body viscerally responds to it. It is an aching anger that comes from the gut, and a quiet hurt that haunts your heart. Needless to say, feeling helpless is not my favorite. One would think I would be used to it. When it comes to diabetes I often feel helpless. But when you see someone in front of you miserable...that is a different story. My boys are very rarely miserable. They are happy and busy kids. But cancer is a totally other animal. Yesterday we had to look that cancer in the eye. We had to let it take over our day. We had to let it hurt. Many many hours of waiting at the hospital, I set my focus on my wrist. I read these words yesterday a thousand times: You can do this. And, COURAGE. The You Can do This bracelet taken from Sara's wrist and put onto mine during Richard Rubin's Diabetes Overwhelmus course at FFL. The Courage bracelet given to me in a tender moment from Wendy, another mother who is like a sister to me. 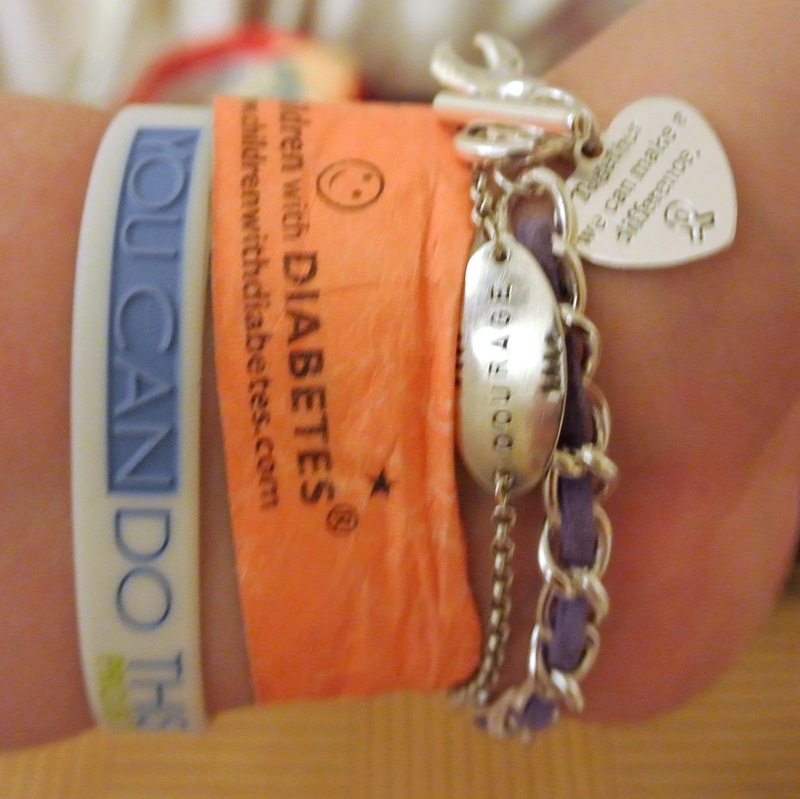 And in the palm of my hand I held the third bracelet, also given to me from Sara. It is a cancer awareness bracelet with a heart inscribed: Together we can make a difference. I was able to take all the love out there and bring it all to one place. And to be honest, I drew strength from it, and it helped. One of the most important lessons I've learned from this journey so far is: small gestures make a big difference. Most often it isn't the grand things that are needed but rather a small token of love, a meal, or even a kind word. We have been recipients of so many kind gestures and I'm ashamed to say I never knew. I never knew that just saying, "I'm sorry, I hear you, god bless." can heal a heart so. I never knew that bracelets, probably monetarily worth very little...could be equal to the mansions in heaven for my soul. I never knew that when a person is having a hard time, just writing on their facebook wall or sending them a text or an email could make them feel BETTER, and lift them up out of the fog. My heart...my surviving all of this...is living proof that it is so. I so vividly remembering you telling me at the end of kindergarten that you couldn't wait for first grade because we'd get homework! And I remember having toasted tuna sandwiches at your house. And I remember the "I hate Angela" sleepover because she didn't invite us to her sleepover. And most definitely I remember us staring as Alice and the Red Queen in our 6th grade play! But most of all I remember that infectious smile of yours!!! I wish more than anything that I could wiggle my nose and make it so that lovely smile would never have to leave your face! We may not have seen each other in years but you are always in my heart! Love you!!!!!! Meri I am very sorry, I hear you and am praying for your family and God Bless you All! When I read your updates I am always reminded to be thankful for what I have, you give me Hope I think if Meri can do it with everything on her plate then I can surely do it too. I wish you Healing and Peace and Love! You write so beautifully, Meri! I'm determined that some day I will get to meet you and your gorgeous family in person. You are all so amazing! I'll be keeping you and your wonderful husband in my prayers until all of this is over. I just know you'll all be coming out the other side with an amazingly beautiful, faith-filled story to share with the world. Love to you all! God bless you and your family! I'm praying for God's healing. I can't even think about taking my bracelet off. I will be wearing it until the moment it goes to pieces and falls off on its own. Meri I am so glad you feel so surrounded by love wherever you are at with all that is going on. I think of you all so much and have been spreading the word of the necessary miracle for Ryan. I hope you are able to find a moment for yourself amidst it all to get refreshed, I wish there was more I could do...anything at all.